A couple of months ago, there was an Blog somewhat laboriously entitled where one of our readers, Mr Kim Spence-Jones made an enquiry about how the drawer fronts were fixed on the chest of drawers in American cherry that appeared in that post. In my reply, I referred Kim to Rob Ingham’s quite excellent tome “Cutting Edge Cabinetmaking”, but at the same time promised a more detailed explanation in a further edition of the Blog. By a remarkable co-incidence, I happen to be going through a drawer building phase and the current job has five of the things. It will by no means be the last as the next piece to be built in the workshop (a chest of drawers for my wife) will have fourteen and yes, you did read it correctly. Fourteen. I leave you to draw your own conclusions…. Digression is wonderful, but it won’t go far to explain the procedure, so with the aid of several photos, this is how it’s done. 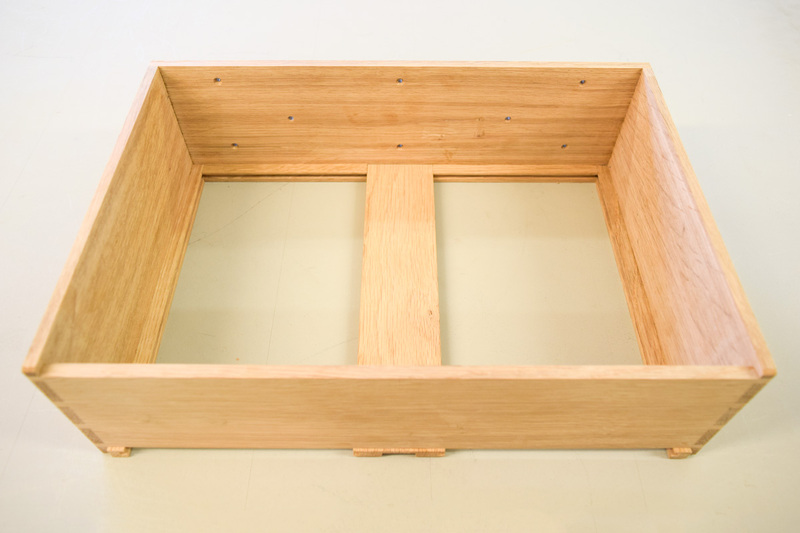 The first image shows the drawer space with the centre rail (19x10mm) screwed into place. Any hard wearing timber will do for this bit and in this instance I used some rock maple (Acer saccharum), not to be confused with some of the softer varieties which aren’t nearly as tough. The drawer is a fairly standard box like arrangement, made from 7mm thick quarter sawn English oak, with through dovetails at the corners. You’ll note that the grooved centre muntin is also made from oak and in an ideal world this should also have been made from maple, except I cut them too short (not the first time an event like this has ever happened), so I was forced to use oak as I’d run out of maple! 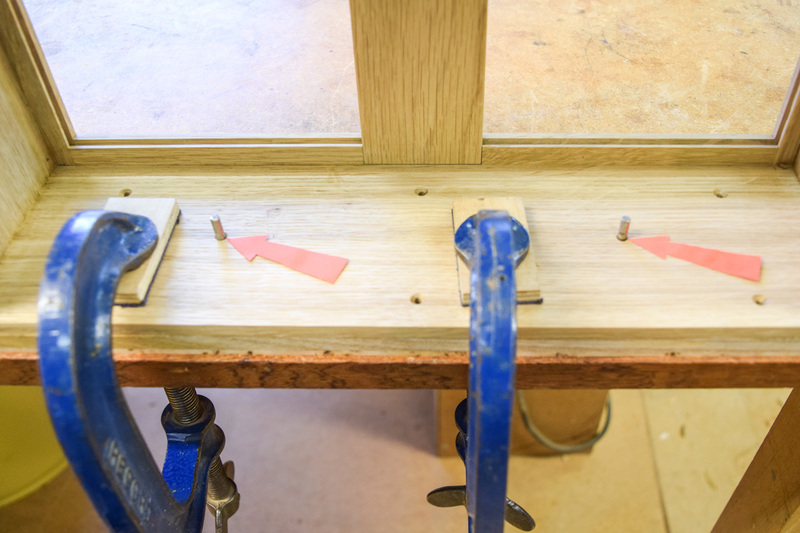 Drawer slips have also been glued in place to accommodate the Cedar of Lebanon bottoms. The centre muntin has been screwed to the rear of the drawer and dowelled in place on the front, which can be seen in the next pic. The drawer is fitted as normal, but there’s no need to be overly fussy about the side clearance and here it’s around 0.5mm or possibly more. The smooth action of the drawer fit is obtained from the centre runner, not the sides. The series of holes in the front can also be seen as well. The green arrow shows one of six 3mm holes for the fixing screws and the orange arrow indicates one of the two 4mm holes for the location pins. 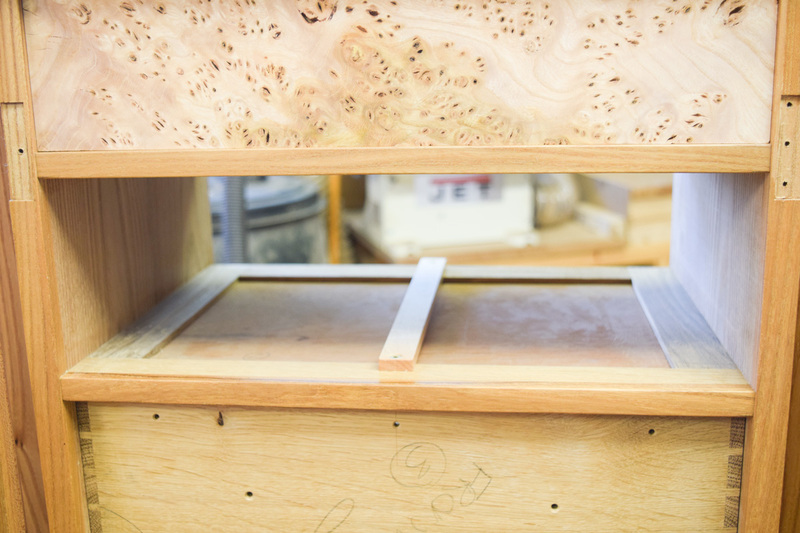 These holes should, of course, be drilled and countersunk from the inside before the drawer box is glued. 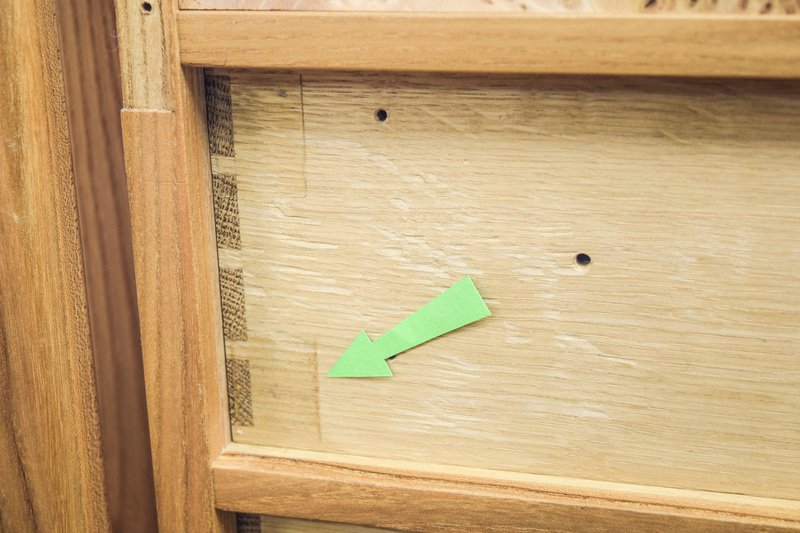 Once the drawer has been fitted, apply some double-sided tape (green arrow) to the corners. The next step in the procedure is to fit the front so it’s a tight fit and just squeezes into the opening. Then remove it and insert the drawer box. The front is then reinserted so that it sticks to the double-sided tape and, once there’s a good bond, the whole thing can be removed. 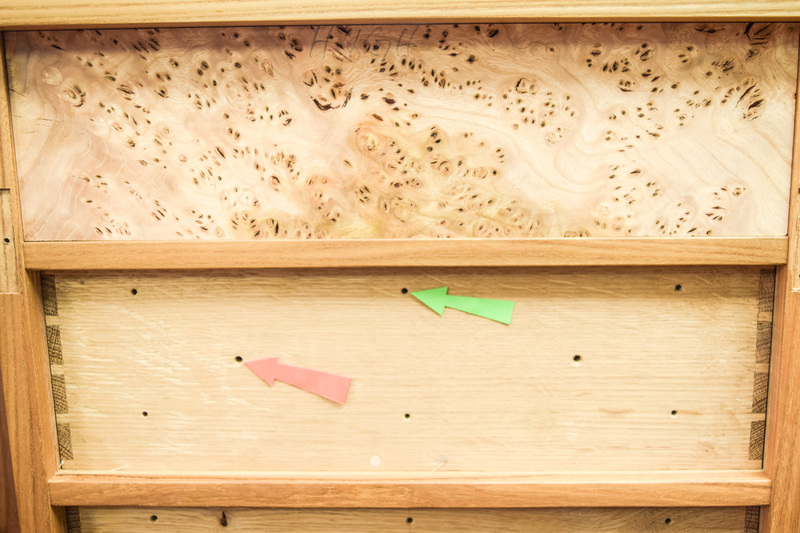 At this stage it’s worth mentioning that the front consists of a 4mm thick bandsawn burr elm veneer that’s been stuck to an 8mm thick, solid elm substrate using the West System epoxy which means that the complete front, including the drawer box, is 19mm thick. As there may be a slight bit of ‘slippage’, it should immediately be turned upside down and clamped to the bench top. 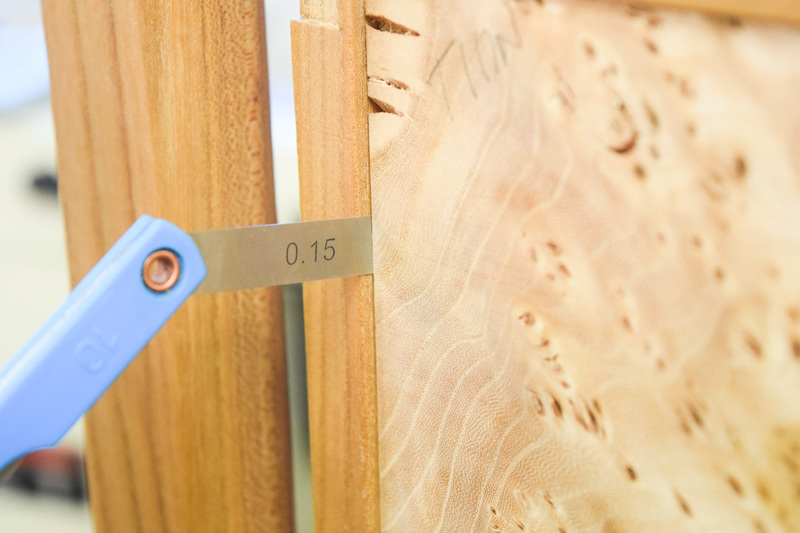 This is to enable the 4mm holes to be drilled into the drawer front and the pins inserted. The pins ensure that once the front has been separated from the drawer box for polishing, it can be relocated exactly in place with the pins. The final stage is to fit the drawer front. As it’s only the front that needs attention, a very close tolerance is possible and you’ll be able to see from the image that it’s been fitted all round using a 0.15mm feeler gauge. Making drawers like this is immensely time consuming and a bit convoluted but it does ensure that you can quite easily achieve a very good fit. The other advantage is that false fronts could allow, if required, a completely smooth facade without the transition from one drawer front to the next because of the frames.